Learn to cook a full fledged Indian meals from a chef in an Indian home..
Options for vegetarian and non-vegetarian food.. Learn the basics of an Indian kitchen and how to use spices..
Delhi is a beautiful and wonderfully vibrant city that has been booming for many years now and it's only getting stronger! Not only is it open to the world's largest Hindu temple and southern Asia's largest shopping mall, but it's also a world hub for business, technology and fashion. Despite all of the city sprawl that has happened with its massive growth, the city didn't forget to keep itself sustainable and green with hundreds of parks and protected forest reserves as well. 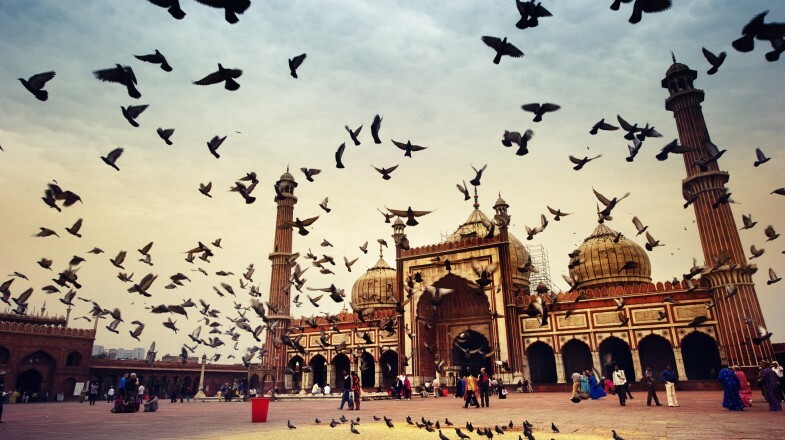 The Jama Masjid is India's largest mosque and definitely a sight to see with its large archways and two tall towers! It's also located right next to Old Delhi's Red Fort area which is an absolutely stunning sight to see in the old city and was the home of the emperors until the mid-1850's. No trip to India would be complete without immersing yourself in one of their many wonderful markets. Located near to the Red Fort, you'll find anything from spices, nuts, herbs, tea, rice, and so much more! Be prepared as the smell from the spices can be overwhelming on your first time. While the Taj Mahal isn't within Delhi, it is definitely one of the top travel destinations and is located only 3 hours away from the city and is a very worthwhile day trip. While the official language in Delhi is Hindi, English is very widely spoken as it is considered the language for business/government use. You shouldn't have a problem being understood when asking for help or directions. When traveling around India, you cannot use foreign currency so be sure to convert your dollars or other currency to the Indian rupees before you go around. Many hotels, stores and restaurants will accept credit cards, but for taxis, tours, and street vendors you will need local currency for it. India has different seasons, so be sure you check what the weather will be like when you go. Spring time (May/June) can be terribly hot followed by monsoon season from June – August. So best to go before spring or during fall to get the perfect weather. New Delhi (population: 18.2 million), the City of Djinns, welcomes you to relics from another era, historic architecture, magnificent colonial constructions, Mughal mausoleums, old-world bazaars and medieval forts. Despite all this, the city also presents glitzy malls, exotic nightclubs, a fast-paced lifestyle and a cosmopolitan experience. The Indian capital gets a bad rap for lots of things. Ticking off to-dos and dealing with touts leaves you feeling underwhelmed, but the city also gives you a chance to fall in love with its more rewarding corners such as the Lodi Gardens, Qutb Minar, Red Fort or the Purana Qila. There are all kinds of adventures to experience and things to see while in Delhi. Once you’re done with Mughal architecture, visit the Akshardham or the Lotus Temple, the ideal places to rediscover your lost spirituality. And don’t forget to sharpen your bargaining skills before your shopping expedition to Chandni Chowk. The ideal time to visit New Delhi is between the months of October to March, when the weather is at its beautiful best. The winters tend to get quite cold, so it is best to carry some warm clothes with you. Delhi summers are scorching hot, so try and stay away from the city during the summer months. Although Delhi has an extensive public transportation system, we recommend you to stick to hiring a chauffeur-driven car from a reputed travel agency. Most hotels can also arrange transportation. A cheaper alternative is to use taxi apps such as Uber. Delhi is the current capital of India and the former center of government of colonial Britain as well as the Mughal Empire. It is a massive city with a population of 10 million. It’s crowded and noisy, but it is India and there a many many things that people can enjoy in New Delhi. Taj Mahal is one of the most beautiful monuments the world has ever seen. Combine this spectacular piece of Mughal architecture with the heart-warming love story behind its creation and it attracts millions of people every year. A 3-hour drive from New Delhi is worth the travel to see this massive palace of white marble. The Red Fort (Lal Qila), constructed in 1648, was the residence of Mughal Emperors who ruled India. It still serves a venue for important political events and speeches. The rich architectural styles of the Mughals are on display in this colossal complex’s courts, gardens, baths, mosques, walls, ceilings and roofs. Enjoy the tranquility of Lodi Gardens and get away from the hustle and bustle of Delhi. This 90-acre city park features not only green spaces but also the tombs of several Lodi rulers. These tombs depict the architectural styles of the Lodis who ruled over Delhi during the 15th and 16th centuries AD. Visit local temples dedicated to various Hindu gods and goddesses and gain insight into the impossibly complicated religion of Hinduism. Some notable temples include Akshardham Temple, Bhairo Temple, Sai Baba Temple, ISKCON Temple, Gauri-Shanker Temple, Hanuman Mandir, and the beautifully designed Baha’i Lotus Temple. There is no way one can escape the spicy aroma of North Indian dishes. So, sampling some of these wonderful cuisines is a must-do when you are in Delhi. Whether you choose to go to an up-scale restaurant or eat on the street, make sure you try a few spicy dishes and kill the burn with Delhi’s signature sweets. Go shopping for handicraft, clothing, jewelry, books, textiles and spices in some of the markets around Delhi like Chandni Chowk, Dilli Haat, Central Market at Lazpat Nagar, Janpath and Tibetan Market, the underground Palika Bazaar and Khan Market. Visit the Parliament House - the seat of government of the largest democracy in the world. This incredibly massive circular edifice is half a kilometer in circumference and is ornately designed. Completed in 1927 under the British rule, it has been the center of governance ever since. Delhi lies close to the Himalayas as well as the Rajasthani desert so it’s climate is classified as a combination of monsoon-influenced humid subtropical and semi-arid. Summers (April-June) are hot and dry with occasional thunderstorms. Delhi is hit by extremely hot winds (or loo) from the western desert and temperatures can soar up to 45° C or more. Average summertime high is around 40° C and low around 20° C.
Winters (December-February) are extremely cold and densely foggy due to the effects of the Himalayas that lie North of Delhi. The winter averages high of around 9° C and low of 0° C. It even though temperatures may plummet below zero, it never snows in Delhi. Monsoon (July-September) marks the season of heavy rainfall and a humid climate. Early Monsoon is fairly hot at around 40°C but the temperatures start to drop below as August approaches, which is also the wettest month of the year. The official currency of India is Rupees and some businesses will accept US Dollars, GB Pounds or Euros but the exchange rates may vary markedly from place to place. It is advisable to change currency beforehand or carry a credit card (Visa or MasterCard) that can be used in India. Whether you are a novice traveler or an experienced one, you will find New Delhi exciting, exhilarating and unique. Plan you trip according to the weather and your tastes and you will not be disappointed by this megalopolis.